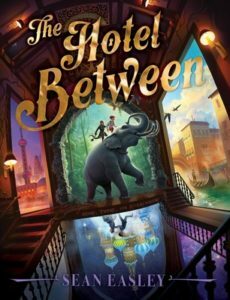 The Hotel Between by Sean Easley, a middle grade fantasy published 2018 by Simon and Schuster, 341 pages: a review. Cameron, age 12, lives in Texas with his grandma and twin sister Cass, who is confined to a wheelchair. A vacant strip mall he passes every day on the walk home from school suddenly has a fancy new sign on one of its doors: The Hotel Between. Cam peeks in at the door and is amazed to discover an elegant lobby with a multi-story chandelier, somehow packed into the one-story building. Explore? Not now. Duty calls him home. A kid his age, Nico, pays him a visit and invites him to the Hotel. Cameron has always wanted to find his lost dad, and this might be the way to do it. So, even though Cameron is anxious about pretty much everything, he goes with Nico to explore the magical hotel –where walking through a door instantly takes you across the globe to someplace else. Intrigue shows up quickly. Cameron strikes agreements with Nico and friends, who label the man in charge of the hotel as the bad guy. But things happen that cause Nico to seriously wonder which side is the bad guys. The plot unfolds with plenty of surprises. While I love the basic concept of the Hotel Between, I found myself confused at multiple points in this book, about the bad guy question and especially about how the magic system works. The book is packed with lovely literary descriptions of the hotel and the places it can take you. I wonder whether a typical twelve-year-old reader would find the descriptions too long and the pace too slow. What an interesting premise! And I like the sound of all the intrigue, too. I think one of the tricks for an author writing magic is figuring out how the world words. Thank you for reviewing!